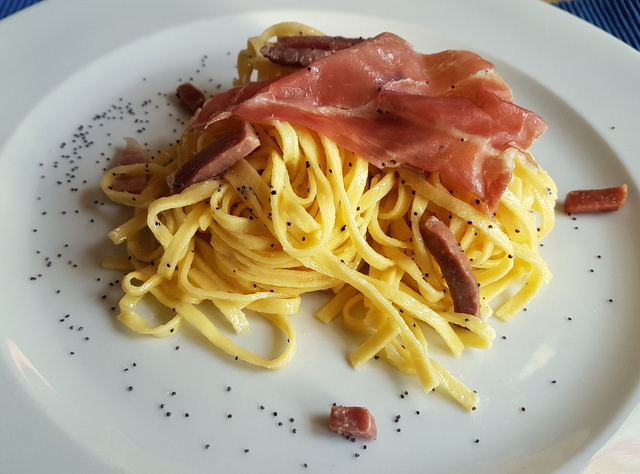 Tagliolini al Prosciutto di San Daniele with Poppy Seeds; Recipe from Friuli Venezia Giulia. 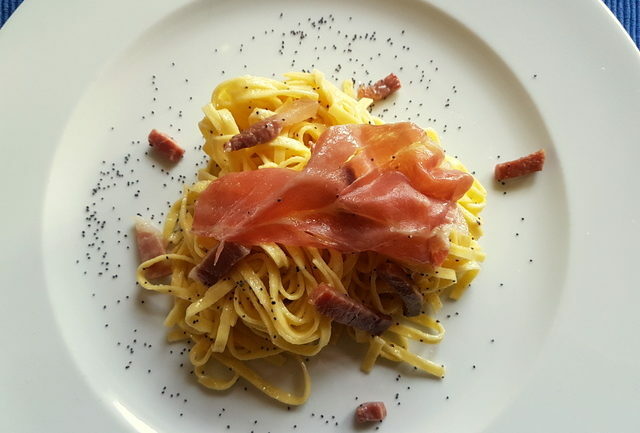 Tagliolini al prosciutto di San Daniele is a creamy, rich and luxurious pasta recipe from Friuli Venezia Giulia. It is made with one of Italy’s best melt-in your-mouth prosciutto crudo. Italians have been preserving pork meat with salt since before the times of Ancient Rome. However, it was the Romans who first started air curing salted pork to make what, today, we call Italian prosciutto crudo. There are a number of different types of prosciutto crudo here in Italy. But, only 7 have DOP certification (according to the information I found). This means these cured hams were granted a Protected Designation of Origin by EU and are guaranteed to come from a particular geographical area of production. They are also cured using only sea salt (no additives) and conform to strict methods of maturing and drying. In addition, they are made from the meat of pigs born and bred in Italy. The two most prized prosciutto crudo in Italy are prosciutto di Parma, from Parma in Emilia-Romagna. and prosciutto di San Daniele from the town of San Daniele del Friuli in Friuli Venezia Giulia. These two towns have the longest tradition of curing ham in Italy. 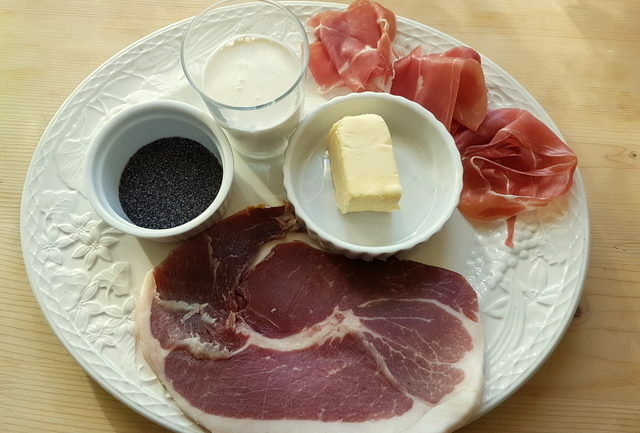 Many non-Italians know prosciutto di Parma (Parma ham) but, have you ever tried prosciutto di San Daniele? Both these hams are, of course, fantastic.However, of the two, I think I love the San Daniele a little more. It’s sweeter than Parma ham, which can have a nuttier taste. This is because sometimes Parmigiano Reggiano whey is added to the pigs’ diet. Making this tagliolini al San Daniele with poppy seeds. 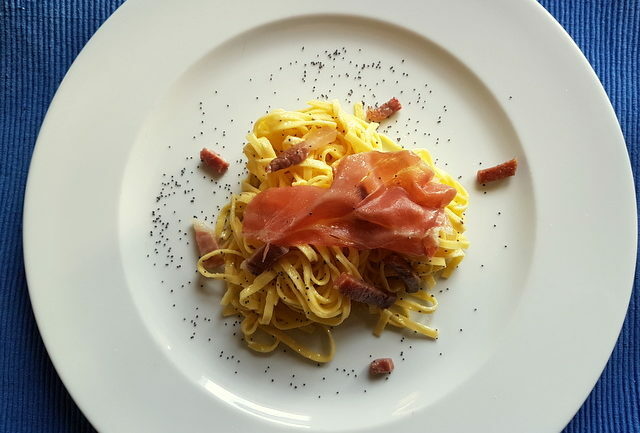 This tagliolini al San Daniele recipe is a traditional dish from San Daniele del Friuli, where the ham of the same name comes from. However, it’s popular throughout the Friuli Venezia Giulia region. Like so many Italian pasta recipes, this is super simple to make and contains only a handful of ingredients. It really is the prosciutto that makes this pasta recipe so flavourful. 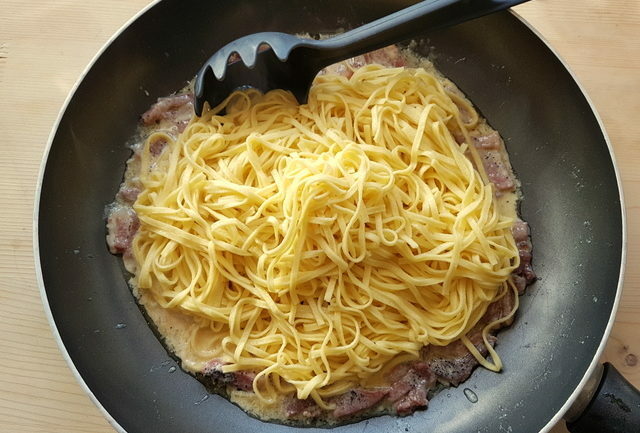 To make this pasta dish, firstly, the prosciutto di San Daniele needs to be cut in two ways. You will need a thicker slice which you then cut into small cubes or juliennes. Plus, a few thin slices to serve on top of the pasta and sauce. 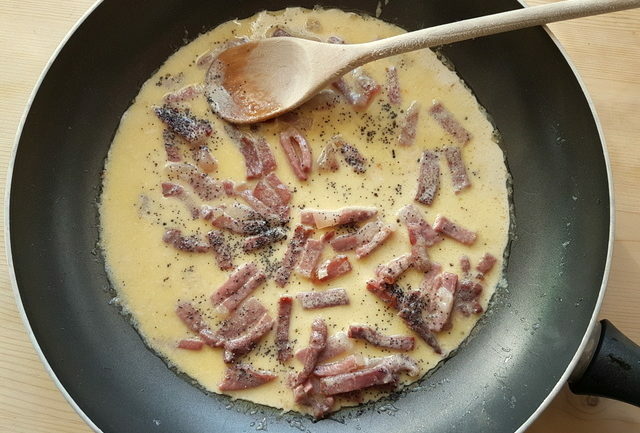 The sauce for this tagliolini al prosciutto di San Daniele is made by frying the small pieces of prosciutto in butter until they change colour and then adding cream and poppy seeds. To finish off, just add the cooked tagliolini to the sauce, mix well and serve with slices of San Daniele and more poppy seeds (if required). Pasta with poppy seeds is actually an Eastern European dish. Versions of it are eaten in Slovakia, Poland, Hungary, The Czech Republic and Austria. Since parts of Friuli Venezia Giulia once belonged to the Austro- Hungarian Empire, it’s not surprising that the food in this region was influenced by those countries’ cuisine. Plus, the capital of this region, Trieste, was an important spice port for the Empire and many spices arrived in Trieste on their way to Hungary and Austria. There is also a regional recipe for pasta with poppy seeds (no prosciutto) which is popular in Trieste. The only variations I found for this tagliolini al prosciutto di San Daniele recipe involved the poppy seeds. 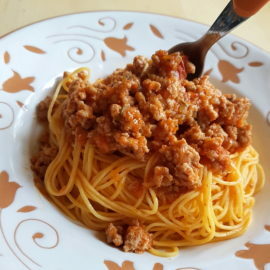 Some recipes say just to sprinkle them over the pasta and sauce once plated. Others recommended adding them to the sauce and in some cases toasting them first. I toasted them to bring out the flavour and added them to the sauce too. 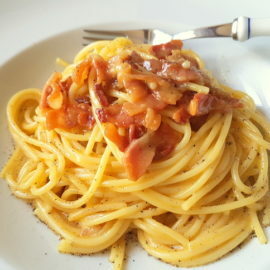 You can also make this tagliolini al prosciutto dish without poppy seeds if they are unavailable. However, I would recommend using cured ham from San Daniele rather than Parma ham to be able to really appreciate the authentic flavours. But, if you can’t find San Daniele then, of course, other types of prosciutto crudo would work too! 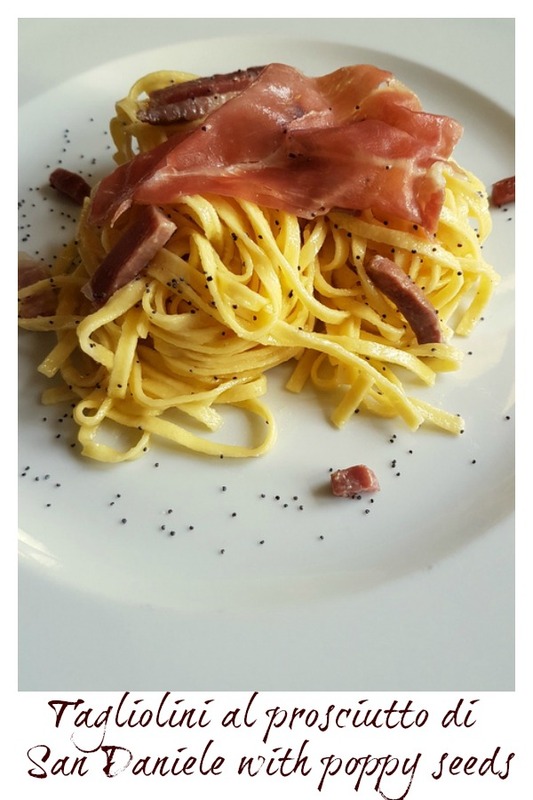 If you do try this tagliolini al prosciutto di San Daniele, I’d love to hear what you think. Please write a comment here on the blog or post a comment on the Pasta Project Facebook page. 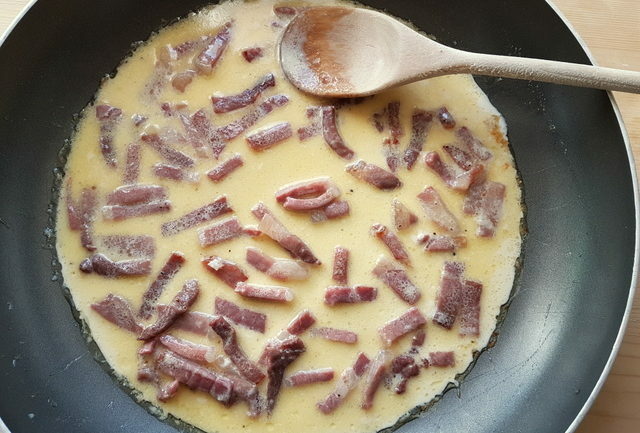 Cut the thick prosciutto slice into small cubes or juliennes. Dry toast the poppy seeds in a small frying pan until they are fragrant (2-3 minutes). Don’t let them burn. Bring a large pot of water to a boil for the pasta. Add salt once it starts to boil and bring to the boil again. Heat butter in a deep frying pan or skillet. 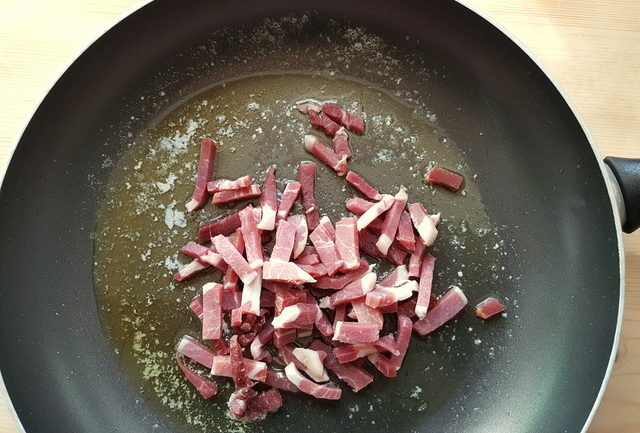 Add the cut pieces of prosciutto and let it saute for 1-2 minutes, until it changes colour. Add the cream, stir and add some of the toasted poppy seeds. Let the cream reduce slightly and then remove from the heat. Add black pepper and salt to taste. Cook the tagliolini until al dente according to the instructions on the packet. If fresh or homemade the pasta will cook very quickly. Drain the tagliolini and add to the pan with the sauce. Stir everything together well and let it cook for a couple more minutes on a low heat, until the sauce is partially absorbed. Plate the pasta and sprinkle some more poppy seeds on top. Arrange a thin slice of prosciutto on top and serve immediately. You can use other pasta ribbons such as fettuccine or tagliatelle instead of tagliolini. This recipe is best made with prosciutto di San Daniele, but other prosciutto crudo such as Parma ham would work too. This looks SO delicious! Pasta is the ultimate comfort food but you just amped it up here! Whenever I read your posts, I feel like I’ve taken a trip to Italy. Every single dish is incredible. I just forwarded your page to my boyfriend’s mother. She’s Sicilian and loves cooking new pasta dishes. She’s going to love your recipes! Simple yet full of flavor. 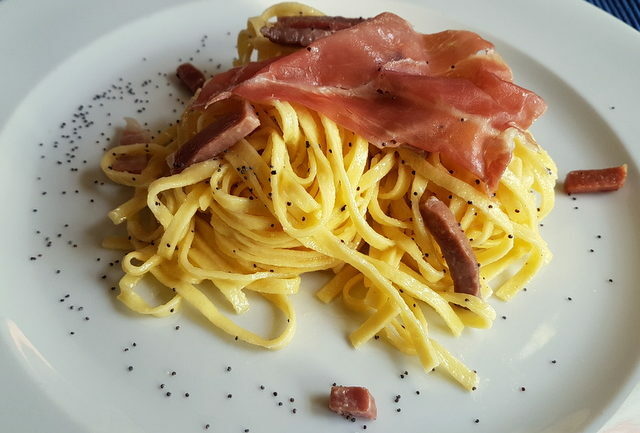 I’ve never had poppy seeds in my pasta but I’m excited to try this tagliolini al prosciutto! Thank you for suggesting using cured ham from San Daniele over Parma ham because I doubt I would care otherwise. I rarely cook with poppy seeds, so with your detailed suggestions this will be a great experience for me! Looks rich, delicious and simple to make. I can’t wait to try, especially with poppy seeds! I’ve never thought to add poppy seeds to my pasta! Thank you Tara! Yes, that’s what I love about this recipe, it’s delicious but simple to make! In Italy, poppy seeds with pasta is actually only traditional in Friuli Venezia Giulia. However, it’s traditional in a number of Central and Eastern European countries. I soooo need this in my life. What a beautiful plate of pasta, and I am intrigued by the addition of the poppy seeds! I can’t wait to try this one! I’m sure you will love this recipe if you try it! The poppy seeds add an unusual but delicious flavour and texture! I’ve never had poppy seeds in a pasta. What a creative dish! Looking forward to trying yet another great recipe from you! Thanks so much Amanda! I’m happy to hear you want to try this recipe! I’m sure you’ll love it! The poppy seeds are a great addition! I’ve never heard about poppy seeds with pasta, but why not, it sounds delicious! Also, definitely going to keep my eyes open for the prosciutto di San Daniele. I’m sure you’ll love prosciutto di San Daniele, Stine. It’s melt in your mouth delicious! Poppy seeds with pasta isn’t traditional in Italy except in Friuli Venezia Giulia! But, it’s traditional in parts of Central and Eastern Europe. I really like it! This is so rich and savoury. These are my favourite cured meats. Lovely! Thank you Jori! Yes Italian prosciutto crudo really is wonderful, especially San Daniele! Wow… It looks and sounds amazing! Totally my kind of pasta. Love the addition of poppy seeds in it. Thanks so much Geetanjali! This is a fabulous recipe. I love the poppy seeds too! I am sure to like anything with prosciutto and this pasta dish looks like such an amazing show case of it! Grazie Candiss! I’m a big prosciutto fan too and it goes so well with pasta! Prosciutto I like the jewel of cured MEAT! It reminds me of living in Spain. This looks amazing. Thanks so much Jeannette! I agree Italian prosciutto is tops when it comes to cured meat! So delicious! I have heard of your blog before but I didn’t realise you had such amazing recipes on here until now. I’m going to be on here all the time now! I studied pasta as my Food Technology focus area at school many moons ago, and fresh pasta will always have a special place in my heart now. Am thrilled you like the recipes here Kacie! I’m sure you’ll find some delicious new ones to try out! Interesting that you studied pasta. Would love to hear more about that one day! 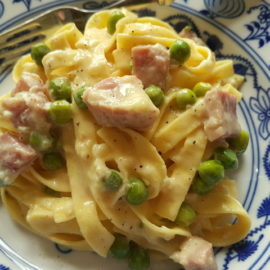 The pasta lover in me…would love this for dinner any night of the week. Pour me a glass of wine, and call this dinner. What a great idea for “date night at home”. 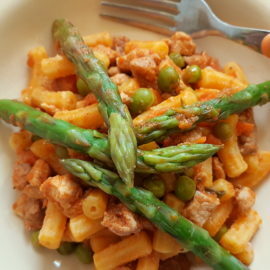 This is a great dinner recipe Gloria, especially for a romantic dinner. It’s luxurious without being very time consuming! This looks like a fabulous recipe! Being of an American-Italian background I usually see more of the American version of Italian foods, but sigh… I do love more of an authentic Italian dish when I can get one. Such a huge difference in the way my grandmother grew up eating compared to myself. I love this blog! Keep the recipes coming. Good evening from Verona Heidy! Many Italian pasta dishes are actually quite simple and not so heavy. It’s the freshness and quality of the ingredients that make them so delicious! 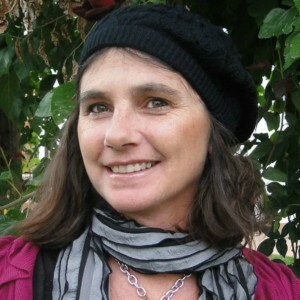 I’m thrilled you love my blog! I hope you’ll come back and visit soon! I’ve never tried pasta with poppy seeds. That is such an interesting combination! I agree Alina pasta with poppy seeds is a really interesting and unusual combination, at least in Italy. Apparently it’s quite traditional in some Central and Eastern European countries! I hope you’ll try it! So happy to hear you tried and liked this recipe Neli! I love this dish and especially because it’s both delicious and easy to make! This looks delicious, I’ve never heard of this recipe before sounds interesting with the poppy seeds! Thanks Nathan! This is a fab recipe. The use of poppy seeds really makes it special! I love the mixture of two different kinds of prosciutto in this recipe! It’s my perfect pasta dish! Thank you Cliona! Prosciutto and pasta is a great combination! This is definitely my kind of pasta. Just looking at that prosciutto has me drooling a bit – it sounds incredible! Grazie dear Danielle! 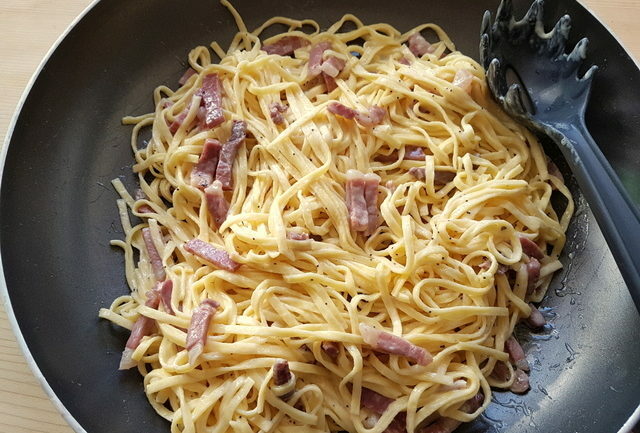 This prosciutto really is fantastic and goes so well with pasta! I’ve never heard of this pasta dish before, specially as it uses poppy seeds, it sounds really so good that I must try it a.s.a.p. Also San Daniele is my favorite crudo, on top of Parma! This is an unusual pasta recipe Patty. In Italy, poppy seeds and pasta are only traditional in Friuli Venezia Giulia. But it’s traditional in some Central and Eastern European countries like Hungary and Poland! San Daniele is my favourite crudo too! I’m sure you’ll love this dish!